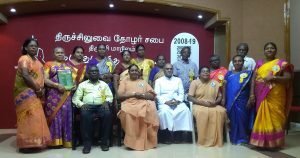 The celebration of the 10 years of successful completion of the annual meet of Lay Associates (2008-2018) was conducted on 10th March 2019, from 9.00am to 4.00pm at Sophie’s Hall, Holy Cross College, Trichy. There were 110 Lay Associates from 13 Units. 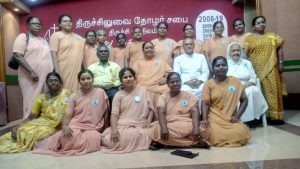 The first session began with a meaningful prayer in which the significance of milestones and the activities of the yester years (2008-2018) were brought out by the Butterworth Unit. Followed by an hour of reflection shared by Rev.Sr.Mary Johnsi Amaldas on the topic “Joyful Witnesses of Christ’s Mission” and 19 God’s abundant graces from the book of Hosea”. There was a group sharing on the obstacles in reading the Word of God followed by adoration of the Blessed Sacrament. Thanksgiving Eucharistic celebration was celebrated by Reverend Father Marianus Isaac for the milestones as God had travelled with our lay associates during ten long years. During the Eucharistic celebration 14 Lay Associates renewed their promises. We had the presentation of Annual Reports followed by felicitation. 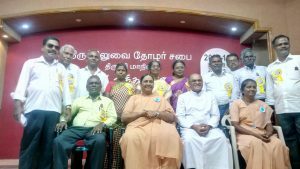 Our provincial Rev.Sr.Jyothi Selvaraj and the golden Jubilarians – the President Mr & Mrs.Joseph Raj Rosebel were honoured. The day came to an end with the Unit wise photo session.